For all the people, pizzerias and traffic, it’s easy to forget we live on an island. Sure we know it’s technically an island, but the idyllic portrait of a sparsely populated spit of land where pineapples grow roadside and drinks come with tiny umbrellas usually trumps our reality. While Long Island may not have palm trees or thatched roof villas, it shares one important thing with fine island paradise: Access to seafood so fresh it smacks of the salt world it was yanked from hours earlier. 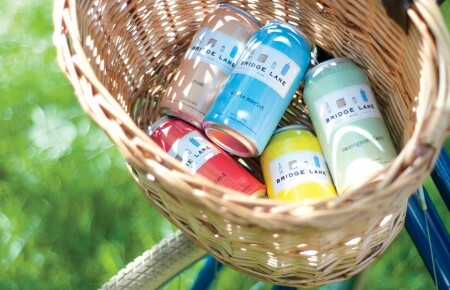 Summer’s here to reinvigorate our interaction with the sea, when some of the best tasting food is caught in our waters. How to purchase, prepare and handle seafood is no small thing. 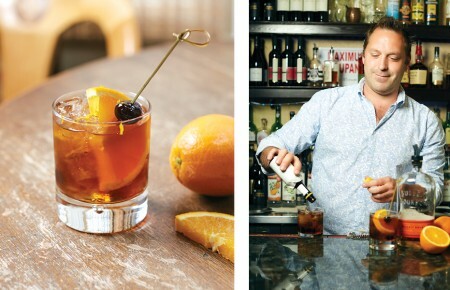 Who better to ask than three top chefs for their surefire ways to take advantage of the local bounty. Though it wasn’t in the morning sun, James McDevitt often sat on a dock, with his feet dangling over Chesapeake Bay as a fourth grader catching crab. “We’d crab throughout the night until it got dark and if we had a good day we’d carry home a bushel. My mom would boil them and add some Old Bay,” McDevitt said. For a short window starting in April, blue crabs molt in the waters off Florida, shedding hard shells and growing new ones. By summer they’re in the Great South and Peconic Bays. Catch them before that new shell forms and nearly the entire crab is edible, quite a departure from how most people think of them. “When most people eat crab it’s picked meat, like crab cake. Eating a soft shell isn’t really meaty-meaty, but you get the nice contrast with the crunch and it’s a fresher crab taste.” Buy soft shells from the fish market cleaned if you plan to cook them that day. Tossing them on the grill over medium heat will cook them quickly and let them pick up a hint of smoky flavor. Season the crabs with olive oil, salt and pepper and set aside. Grill the fingerling potatoes until cooked through, about 8-10 minutes. Toss the scallions and leeks with olive oil, salt and pepper and grill with the bacon, then remove to a covered plate. 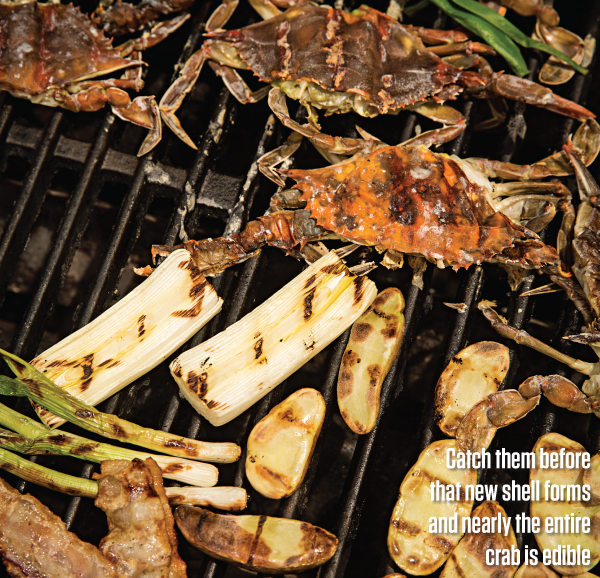 Grill the crabs, shell side down first, for about 2 minutes per side over medium heat, trying not to char them. The crabs are done when firm to the touch. Plate them atop the grilled vegetables and garnish with bacon and lemon pepper mayo (below). A good fish market is more than some display cases stocked with whole fish—any mega mart can do that. Find the fish guy who knows where his seafood comes from and he’ll have excellent advice on how to prepare it. These three are worth standing in line for. What started as an oyster shack grew into a local company with international reach. Third generation owner Ken Homan has local fish covered and routinely ships to the Fulton Fish Market. When local catches from Gardiners Bay, Mattituck Inlet and around Robins Island pass through the market they might meet up with branzini imported from Greece or Patagonian red shrimp. Want something really impressive? Pick a whole fish, wait while they cook it, then take it home and enjoy the praise. If there is a line out the door at Cor-J Seafood, know there is a small army inside working to get you in and out. DeAnna Hoera, the manager and daughter of a former lobsterman, said things gets kind of crazy as they help up to 400 people a day. “We have seven or eight girls at the counter taking orders and another eight people in back cleaning fish and filleting.” Head there for a take home dinner or, if you feel a little more hands on, their steamed, cracked lobster wrapped in foil that only needs to be tossed on the grill. When we called for owner Artie Hoerning, he was out fishing for fluke. No surprise hearing the man in his mid 60s is still out there—his market celebrates its 40th anniversary this year. The market-restaurant is South Shore dinning: Fresh fish without the pretense. Expect plastic plates and utensils in a casual setting fit for flip-flops. Don’t have a recipe in mind? Hoering can walk you through how to cook any filet in the place, including the hard-shell crabs that are coming in this month. Well before Long Island became famous for its iced tea there was a small quahog clam that put the town of Little Neck on the map. Fishermen harvested clams from the waters at the edges of Little Neck Bay for years before development forced their efforts east. Clamming in the Great South Bay isn’t what it used to be, but dig into the sand at the edge of the protected waters in places like Cold Spring Harbor, Huntington Harbor and Mount Sinai Bay on the North Shore and chances are clams will be there. 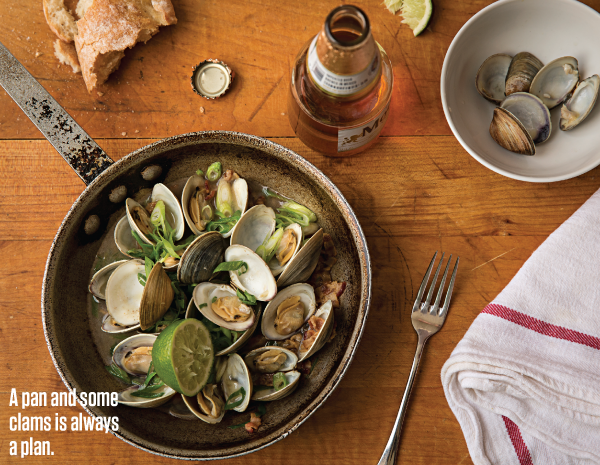 Typically clams are cooked in wine, which provides acidity and the base for a broth to pair with crusty bread, but Tchinnis decided to swap in beer. Rendering bacon produces crispy, smoky bits to contrast with the tender clams while leaching enough fat to sauté the garlic. Adding the beer to the hot fat instantly creates steam, a lid keeps it put. “When the clams open they are done, you can take them another 10-20 seconds but no more than that or they will get tough and chewy.” At the restaurant Tchinnis inverts a sauté pan over the one he’s cooking in, creating the dome that traps moisture. At home a lid from a pasta pot or crimping a sheet of aluminum foil over the top works just fine. Heat oil over medium heat in sauté pan. Add bacon when pan is hot and cook until almost crisp. Drain all but 1 tbsp. rendered fat. Add garlic and cook for 15 seconds until fragrant. Add clams, beer, lime juice and hull, salt and pepper to pan. Cover and cook until clams open, about 8 minutes. Add butter and scallions and cook covered, about 20 seconds. Serve with crusty bread for dipping. Cooking with beer is, by its nature, informal. But that doesn’t mean there aren’t rules. Most summer ales work just fine for steaming shellfish, chicken or brats on the grill, but stay away from heavier porters or stouts. 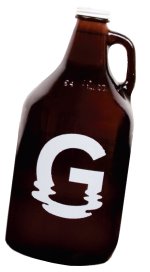 Pulse contributor and craft brew savant Niko Krommydas suggested a few local brews worth bringing home in growlers or cans. 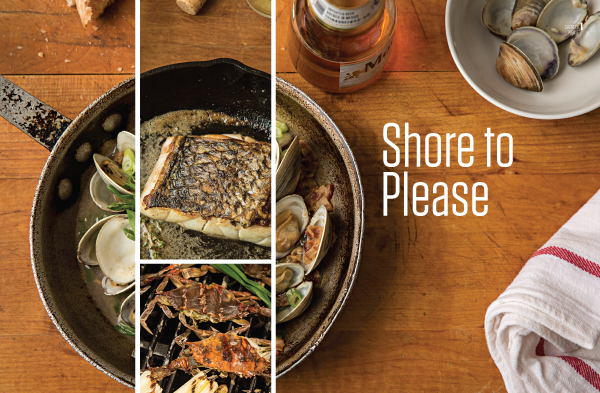 Hooking a striper shouldn’t be that hard come summer when the fish floods restaurant menus. Nearly any fish is enhanced with acid and here that comes in the form of verjus, a sour grape juice. “Wölffer [Estate] makes a great verjus, we love it,” Koenig said. “The dish works because it’s acid, butter, with a nice flaky, sweet fish—it’s just a nice pairing.” The cardamom adds tartness, which helps because the beans are very sweet. In a saucepan over medium heat, toast cardamom, coriander and fennel seed until fragrant, being careful not to burn. Add the sliced shallots, wine and verjus. Over medium high heat, reduce by 3/4, then slowly whisk in butter a little at a time. Remove from heat, strain, season with salt and hold in a warm place for 30 minutes. Run all beans through a bean Frencher or julienne lengthwise. Blanche the beans until just cooked maintaining some crunch, about 1 minute. Shock in ice water and set aside. Over low heat, reheat the beans by slowly poaching them in about 1 cup of the cardamom butter mixture. Season the skin-on bass filet with salt and pepper on both sides. Over medium high heat in a well-seasoned cast iron pan with about 2 tbsps. canola oil, roast the striped bass skin side down, pressing down with a fish spatula for the first 10 seconds. Lower the heat to medium. Once the fish is about 3/4 cooked through, carefully flip it over. Once you flip it, add 3 tbsp. of butter and 2 sprigs of thyme. Quickly baste with the brown butter for about 30 seconds, then remove to a paper towel. Place about 2oz of the cardamom butter in the bottom of a serving plate and top with the fish. Using a slotted spoon, lay the beans over the top of the fish. Garnish with a few chervil pieces. Already deboned and trimmed into filets, cooking fish at home is still a dicey proposition. Unlike robust beef, fish is delicate and has a penchant for sticking to everything, even non-stick pans. But with the right technique fish can easily become Tuesday dinner. Fish owes its iron grip to skin speckled with surface moisture. Leave a heavy-bottomed pan over medium-high heat for a few minutes. Nonstick increases the chances of success, but the skin won’t brown as deeply. Opt for a well-seasoned cast iron or stainless steel pan and depend on fat and time to keep things free. Pat both sides of the filet dry with a paper towel before seasoning with salt and pepper. Add enough of a neutral flavored oil with a high smoke point, like canola, to cover the surface of the pan and heat it until whips of smoke rise. Add the fish, skin side down then act quickly to prevent the filet from curling upwards. 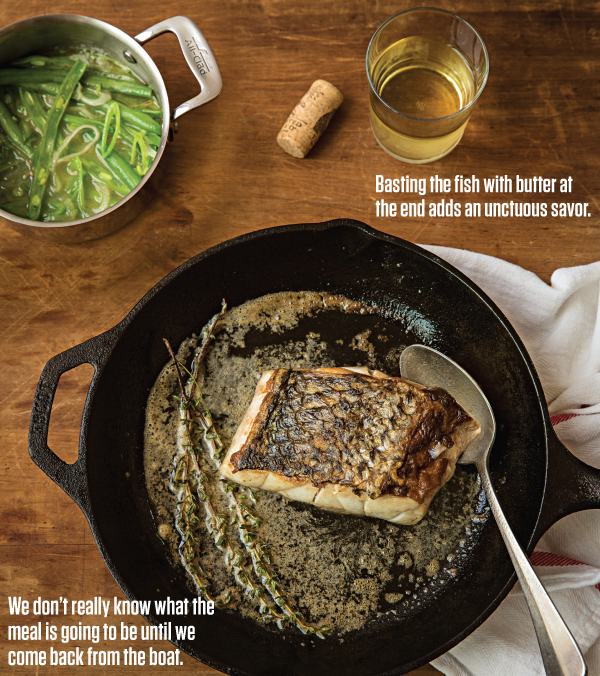 “Press on the fish for 10 seconds when it’s first placed in the pan,” Kyle Koenig, chef at Topping Rose House said. “You will feel little vibrations as you are holding it down—that is the water escaping the skin.” Then the hardest part: Let the fish cook. Don’t fuss with it or flip it. Look for the browned color on the edges of the skin then slide the thin edge of a fish spatula underneath and gently flip it over to cook on the other side for a few minutes. Add a knob of butter and two sprigs of thyme and use a spoon to baste the top of the fish with the butter for 30 seconds. Add a spritz of fresh lemon juice and devour. While nearly any fish that fits in a pan can be cooked indoors, buying the right fish for the grill is vital because of the grates and the uneven heat. Delicate fish like flounder and sole flake and fall apart easily, stick with bluefish, porgies, mackerel or sturdy tuna. Beginner fish grillers should start with fish steaks, which stand up to the heat better because they’re cut across the grain. Heat the grates with the lid on for about 30 minutes before scrubbing them clean and rubbing with a wad of canola oil-soaked paper towels with tongs; oil the fish too.